EASYjoint is the original "All weather" environmentally friendly (contains no cement or resins) paving joint compound which delivers brilliant results and big savings in labour costs for professional hard landscapers and paving contractors. Developed specifically for use with both natural stone and concrete paving applications, EASYjoint is fast and easy to apply in wet and dry conditions and when brushed and washed in, leaves no voids - every nook and cranny filled. Very fast to use - The use of water to wash and fill the joints between the paving is a breakthrough in jointing methodology. It assists the paving grout to compact into the joints so there is no need to 'strike' or 'tool' the joints unless you want a smooth finish. No staining or framing - When used correctly and the EASYJoint instructions are followed there will be no staining or framing to the paving. EASYJoint is safe to use with natural stone as well as being ideal for concrete paving. If you make an error however don't worry, the only stain our jointing compound might leave is linseed oil which will disappear and fade over time. Use lots of water when using the jointing grout and any linseed oil will sit on top of it and get washed away! 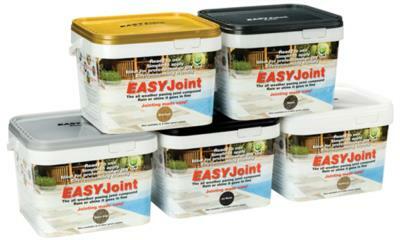 Detailed instructions on how to joint paving with our sweep in sand can be found on this site or in the EASYJoint tub. No Waste- Opened tubs of EASYJoint, if not fully used, can be kept for later use providing they are covered by a minimum of 2" (50mm) or more of water. – There is no waste with our jointing compound, EASYJoint is an environmentally friendly product. For the DIY user of EASYJoint it means that you do the work, the jointing of the paving, when you planned to.